This work is registered in the archives of the Calder Foundation, New York, under application number A02157. “Just as one can compose colours, or forms, so one can compose motions.” (Alexander Calder cited in: Exh. 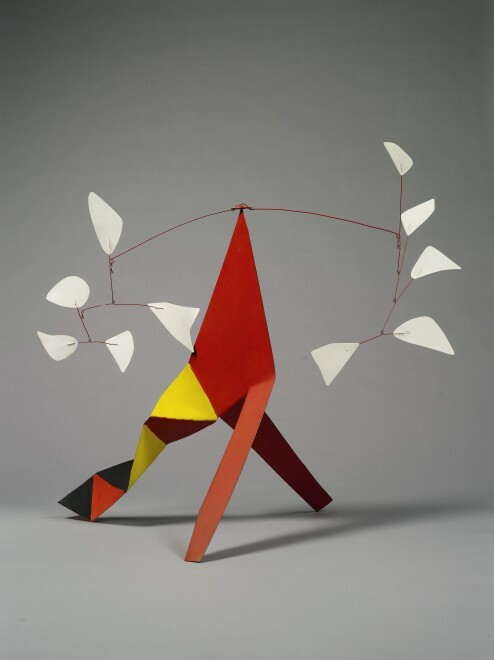 Cat., London, Tate Modern, Alexander Calder: Performing Sculpture, 2015, p. 24) Five White against Five White is a significant example of Alexander Calder’s standing mobiles and addresses his investigations in motion, colours and movement. In 1926, Calder moved to Paris where he became familiar with the work of the leading personalities of the art world of those years, including Joan Miro and Piet Mondrian. It was precisely a visit to the studio of the latter that deeply touched Calder, igniting in him a desire to create “moving Mondrians” (as the artist explained in a letter to Marcel Duchamp dating from 1930). As a matter of fact, the bold colours used for the base of this mobile, and their geometrical shape, recall Mondrian’s famous compositions. The colourful base serves as support for the red superstructure that gives to the sculpture the sense of instability and motion that is characteristic of Calder’s oeuvre. In fact, while in perfect balance, this superstructure can be activated by the slightest breath of air thus creating not only motion, but also a play with light and shadow that is always different depending on the position of the mobile. By doing so, the sculpture creates a sense of ephemerality as the variations it offers are infinite. In light of this, Marcel Duchamp, who had become a close friend to the artist, coined the term ‘mobile’ in 1931 to define Calder’s moving sculptures as he felt the inadequacy of existing words to describe this new kind of art. Alexander Calder came from a family of established artists, however he graduated in 1922 in mechanical engineering, only later he went to study painting at the Art Students League of New York. This double disposition - the rigorous training as engineer on one side and the vocation towards art on the other – is reflected in his mobiles and the work in question here illustrates it perfectly.